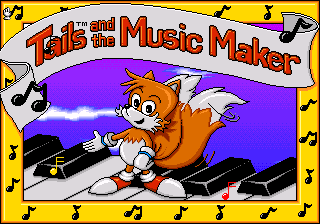 Tails and the Music Maker is an education game for the Sega Pico starring Tails, who uses this game to teach children about music. The object of the game is to learn scales, tempo, rhythm, and about instruments, and then match the music to the instruments. The player may also create his or her own music and teaches children about musical instruments. This educational concept is similar to games like Sonic's Schoolhouse. As with all Sega Pico games, the player uses the Magic Pen and directional buttons to solve different puzzles or play minigames depending on the active Storyware page. In Tails and the Music Maker, there are six pages available. Animated title screen. The main theme plays as black, red, and yellow notes float around Tails. Green Hill Zone is very similar to its appearance in Sonic the Hedgehog (16-bit). There are waterfalls, chequered hills, and palmtrees in the background. Activity 1 - "Travels With Tails": Directing Tails to the waterfall on the left leads to a simple platforming activity through Green Hill Zone in the summer, fall, and winter. At the top of the screen is a box that shows the player what action they are performing. Tails can stop, tiptoe, jump, or run to avoid falling coconuts from trees, collapsing bridges, and pits that spring him back up. The background music changes depending on the action Tails is performing. Unlike the original and more familiar Green Hill Zone, there are no badniks, loop-de-loops, slopes, rings, or spikes. The activity is also fairly slow-paced, and the stage is designed more like that of a more basic platformer. Activity 2: Dragging Tails to the right where the frogs are leads to a game of musical chairs. The player must leap from lily pad to lily pad avoiding the one that is glowing orange. When the music stops, the glowing lily pad disappears. Tails stands in front of a set of platforms that lead up to some sort of musical pinball machine as Dr. Robotnik can be seen in his Egg-O-Matic in the background. Activity 1 - "Percussion Ball": Percussion Ball is a music-themed pinball game in which Tails acts as the ball, much like in Casino Night Zone in Sonic the Hedgehog 2. The bumpers are shaped like percussion instruments, and upon being hit, they emit the sound of the instrument they represent. Activity 2: This activity emphasizes drawing shapes with the Magic Pen. The player must draw proper circles around the notes slowly bouncing around the clef. When a note bounces, the letter of its key is displayed on the bar at the right side of the screen. When a note is circled, its letter will glow green. To complete the activity, the player must circle all of the notes. This page was last edited on 30 March 2019, at 13:06.